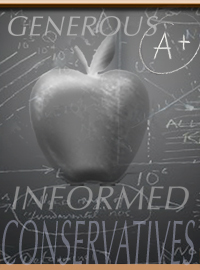 Distorted stereotypes die hard, but the word is getting out: conservatives are more informed and more charitable. We’re all familiar with the mainstream media and popular culture myth: conservatives are stingy, ignorant knuckle-draggers, whereas liberals are enlightened societal benefactors. Now, we have yet another survey demonstrating the cold reality that the opposite is true. Several months ago, we noted an independent Pew Research survey released October 14, 2009 entitled “What Does the Public Know?” Included in that study was a section labeled “Partisan Knowledge Gap,” which asked a series of twelve knowledge questions and compared the scores of Republicans, Democrats and Independents. The questions centered on such matters as identifying the current Federal Reserve Chairman, the current unemployment rate and the issue to which “cap and trade” relates. Unsurprisingly, Pew attempted to sugarcoat the lopsided results under the phrase “no partisan differences on knowledge of health reform, but Reps more aware in other areas.” They wouldn’t want to offend Brian Williams or Katie Couric, you know. This week, we received confirmation that the Pew survey results were no anomaly. Professor Klein, along with Zogby researcher Zeljka Buturovic, surveyed 4,835 American adults on eight questions covering fundamental economic principles. Those questions covered such issues as the impact of construction restrictions on housing prices, changes in the standard of living over the past thirty years, the impact of free trade on employment and what defines a “monopoly.” For purposes of ideological classification, respondents were divided into six categories: very conservative, conservative, libertarian, moderate, liberal or progressive/very liberal. To be charitable, Klein and Buturovic even decided to grade only against flatly incorrect answers. Thus, “not sure” responses for those who considered the questions ambiguous or arguable were not penalized for their ambivalent responses. The results might again come as a shock to anyone confined to mainstream media sources, but they shouldn’t surprise those of us who actually pay attention. Those identified as “very conservative” averaged 1.30 incorrect responses, “libertarians” were incorrect on 1.38 and “conservatives” averaged 1.67. In sharp contrast, “moderates” were incorrect on an average of 3.67 questions, “liberals” incorrect on 4.69 and “progressive/very liberal” respondents were incorrect on 5.26 of 8 questions. So conservatives are more informed than liberals, but aren’t liberals still kinder than conservatives? In May 2008, a Gallup poll of 1,200 Americans confirmed once again that those who self-identify as “conservative” or “very conservative” contributed 56% of total charitable donations, despite constituting only 42% of the population. Those who self-identified as “liberal” or “very liberal,” in contrast, constituted 29% of the population but made only 7% of donations. Notably, these results were independent of income level and religious affiliation, as those placing themselves on the right of the political spectrum donated a higher percentage of their income than those on the left. Somebody sneak that into Obama’s teleprompter feed.